It's an extreme dining experience: 18 feet under the icy sea on the coast of southern Norway. (LINDESNES, Norway) — It’s an extreme dining experience: 18 feet under the icy sea on the coast of southern Norway. Restaurant Under, as it’s called, opens Thursday. It has a set menu that will rotate seasonally, but expect to see lots of fish and shellfish, plus food from the beach outside like sea arrow grass, sea rocket and salty sea kale. The local area is known for wild mushrooms and berries, and those will be used on the menu as well, according to the restaurant’s website. 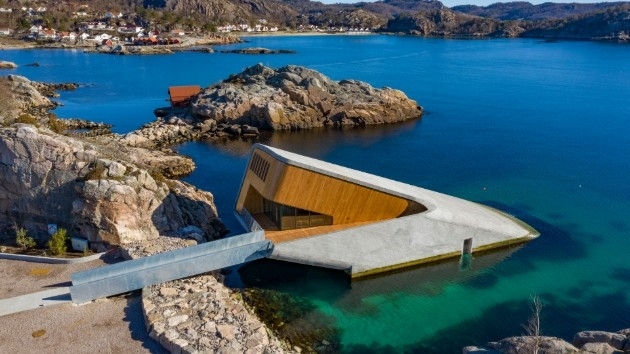 According to Visit Norway, “Under” in Lindesnes is Europe’s first and the world’s largest underwater restaurant. An oak staircase descends into the building, where guests can experience the Norwegian coastal ecosystem out the acrylic windows while they dine. The restaurant will eventually become a part of its marine environment and work as an artificial reef, welcoming marine life to the area. Under is located about 50 miles from Kristiansand Airport Kjevik, the nearest airport.